Spring cleaning offers you a great opportunity for making healthy changes each year, but work and family commitments often make finding time a challenge. Plan your cleaning over several weeks because in most cases a single weekend isn’t enough. Remember: some tasks require several days while others will require preparation time. It’s easy to get overwhelmed while planning your spring cleaning, so remember to keep your plan realistic, and commit to only as much work as time allows. 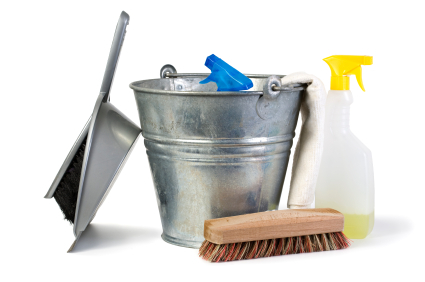 Do you have a particular spring cleaning method that has been helpful to you? Please comment. Make sure you involve everyone in the home so that this is a shared responsibility. Different people have different strengths and different amounts of time to contribute. That’s a great point Jacquie — sharing the wealth gives everyone ownership of the outcome, a happy and clean house! Thanks for commenting. This is the perfect time to set schedules for yearly maintenance checks (ie. quarterly filter changes for the air ducts, refrigerator, sinks, etc…). That’s a good point Tantrum73… you can set a schedule this year and it can be your repeating spring routine for years to come. Thanks for commenting! Remember to change the batteries in your smoke detectors, flashlights, emergency radio and other important devices when you change your clocks in the spring and fall. You’ll never be cursing the darkness nor put your household at risk. Great tip Adrienne. Thanks for the reminder.